long time no proper blogpost – I’m sorry but I was really busy and didn’t want to write half-heartedly but rather make the effort for a proper blogpost. And now I’ve tried something new, I thought I’d give you a little review on the Isadora Peel Off Base Coat. Let me start with saying that I think Isadora is a very nice brand and I really fell for their sugar crush collection last year. They are available quite a lot here in Germany, though I always wonder about the small range of colours they have.. maybe the stores don’t carry all of them, online they have a far bigger selection of colours and finishes. The bottles are pretty small, so they fit less polish than other brands. They are not exactly cheap though, one bottle retails for €8,99 – which is about $12. Still, they have some very pretty colours and I applaude them because they recently came out with a Peel Off Basecoat! Out of all the brands you can buy in stores in Germany, they are the first (as far as I know). I know OPI has one too, but that is just completely unavailable to me. So I was pretty thrilled and thought I’d give it a try, the idea of just peeling off glitter polish in one go is quite appealing to me, much more than the thought of having to use the good old cotton-balls-soaked-in-acetone-covered-with-foil-method that dries out your cuticles like something awful! The Peel Off Base looks like liquid glue in a polish bottle, it’s white and dries clear. The instructions say to wait 5 minutes until the base is (fully) dry, you just need one thin coat. I tried it with a liquid sand glitter polish from Julie G. (sadly with no name) first, I only used it for the middle finger in this mani (the rest was added later, I wasn’t sure where I was going with this so the blue on the pointer and ringfinger just kind of happened later on). 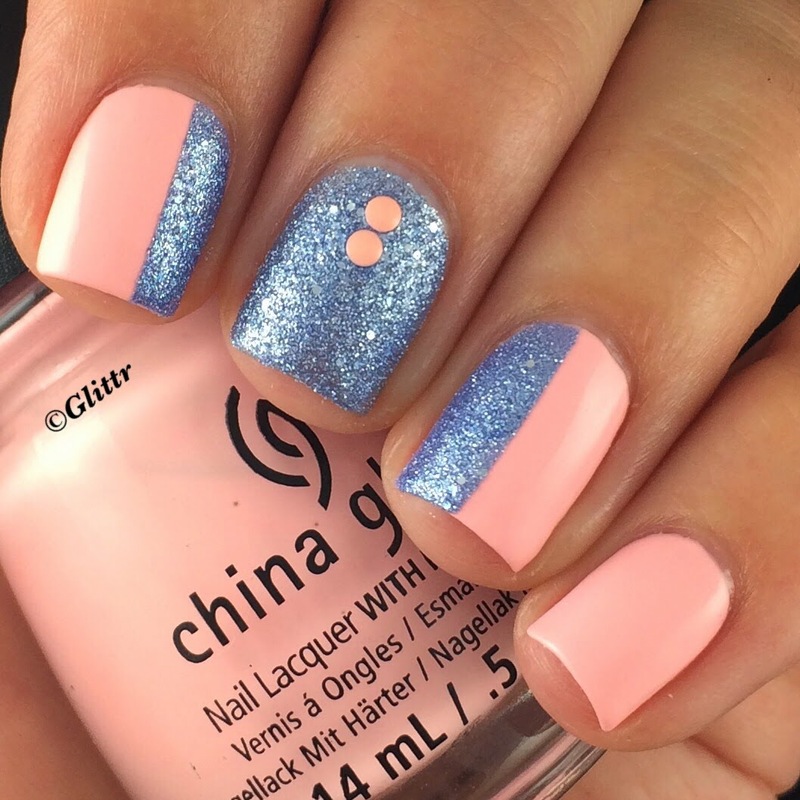 You can’t see anything under or around the glitter on the nail as the base dries clear, so it looks like you’ve used a normal base coat. The great thing is, when it’s all dry you can just pick the polish at any edge and can easily peel off the polish in one go! I tend to not be able to put the base onto the entire nail, there are always thin lines at the side or the cuticle where the base didn’t quite reach, so when you put the coloured polish over it you might paint tiny parts of your nail that you later have to remove with polish remover, but that is nothing compared to having to do the whole nail! This is a massive plus in my book, I could not be bothered to swatch if I had to take off all the polish with acetone or nailpolish remover every damn time, I just don’t know how all the girls do it??! You must be crazy moisturizer freaks, trying to save your skin from drying and dying?! I hope you guys know I’m kidding, I truly admire all the lovely girls that swatch polishes, how else would I be able to see what a polish looks like on the nails instead of the bottle! But I seriously can’t believe you put it on, remove it with acetone/nailpolish remover and do that a few times in a row. Or am I not in on some major swatching secret??! Anyway, for swatching this Peel Off Base Coat is a dream come true. In real life, I didn’t have the best experience. It was late and I had a dinner with my colleagues from work the next night which I was going to head to straight from work, so I thought I’d just slap on a color and be done with it. As I was sure I wasn’t going to keep a plain color on for long and also wanted to put the longevity of the Peel Off Base to the test, I put it on and painted my nails two coats of Essie Forever Yummy (classic red) and finished off with my trusty HKgirlTopcoat from GlistenAndGlow. This was at about 10:30 p.m. The next morning at work I was washing out a mug in the kitchen of my office and suddenly has something else in my hand, after a moments hesitation I recognized it as a coat of nailpolish that had come off of my nail – in one, perfect bit. I don’t know about you, but I can’t really have one nail (also, the pointer finger on my dominant hand) missing a coat of nailpolish and the others being red.. so I took off all the polish off my nails. Of course it was super easy! But as mentioned above, I did have a few tiny lines of red at the side of my nails or at my cuticles, where I hadn’t quite reached with the base coat. So now I not only had bare nails, but with red linings around. Really attractive, right? I didn’t have anything with the me take off the leftover red (I had just cleaned out my makeup bag in my purse and gotten rid of some nail polish remover wipes because they had become really gross over the time) and so I had to endure the evening without a) any polish on and b) red lines around them. I slathered my nails in my favourite nail oil, the Bliss Kiss Pure NailOil and then cleaned up my nails when I came home that night. This was a really interesting post! I have never heard of this product but it really interested me. I always appreciate honest opinions on products before I invest in buying them, so thank you for that. Please check me out over at http://melissygoose.blogspot.com/ Thanks for letting me read, I really like your blog!